An increasing number of UAE-based investors are concerned about the impact of a slowing global economy on their investments, says a study. Over half of respondents (54%) in the study by Old Mutual International and Quilter Cheviot Investment Management believe economic stagnation in the world economy will be the biggest risk to their investments in the next 12 months, up from 39% in 2017. Issues such as growing trade uncertainty, weak economic indicators and a series of global political challenges have pushed major stock market indexes down, something that hasn’t gone unnoticed amongst UAE investors. The results of the survey also revealed that 43% of investors are concerned about interest rate hikes, versus 26% in 2017. Meanwhile, 41% are wary over falling oil prices, up from 39% in 2017. 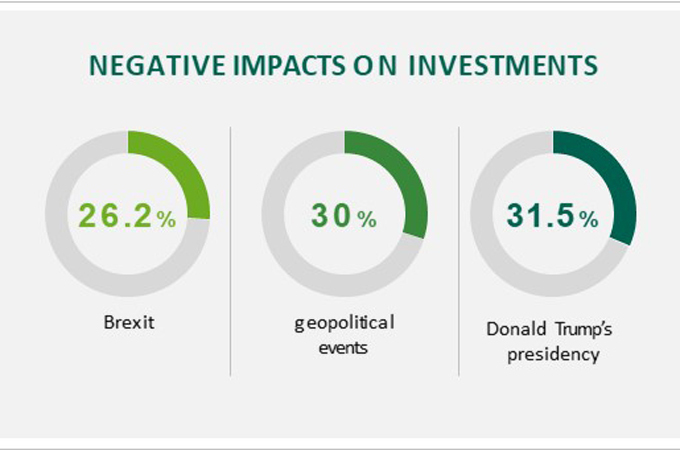 Nearly a third of respondents feel Donald Trump’s presidency in the US could pose a risk to their investments; 30% feel geopolitical events such as terrorism may be a threat; while over a quarter of respondents believe the UK exiting the European Union in 2019 could also have a negative impact on investments. Mark Leale, head of Quilter Cheviot Investment Management’s Dubai representative office, comments: “With everything that is happening globally, it is understandable that many investors are concerned there will be an economic slowdown this year. However, our investment portfolios are well diversified internationally, so issues such as Brexit or falling oil prices are often less of a factor than people think. “Markets will undoubtedly be more volatile in 2019 than in recent years. There are a number of events on the horizon that have fairly unpredictable outcomes, however, we still see attractive opportunities in many markets and continue to recommend the merits of holding a diversified portfolio invested across a range of asset classes.